Jaded Blossom: Make a Wish! I hated that I missed release week last week! 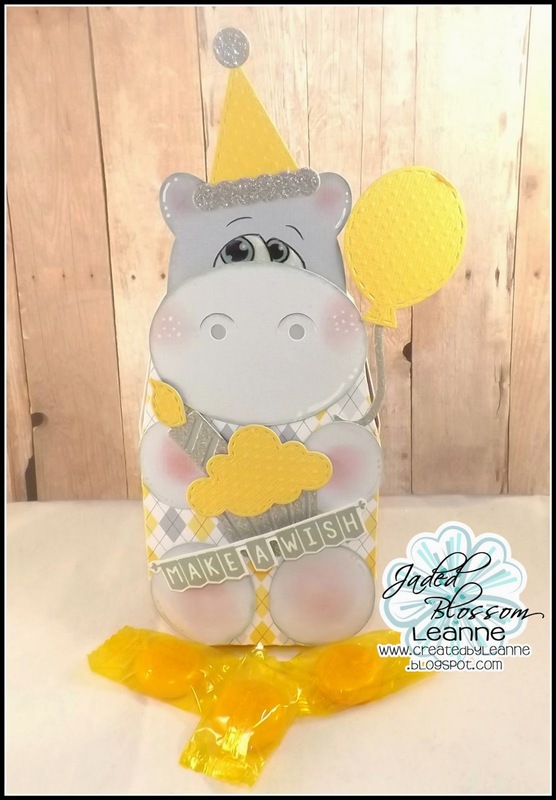 It was such a cute release and I was able to get a few projects made before I got sick so for today I want to share one of those with you :) I found this cute hippo box in the Silhouette store and decorated him all up using the new sets Supersized Birthday Greetings and the new Birthday dies. What a cute hippo treat box. Hope you feel better soon! OMG, so sorry to see you go but I do understand that you must watch out for your health. I'll be 🙏 for a speedy comeback. Your hippo is too darn cute. Super cute hippo box! Fell better! Too cute Leanne...so sorry to hear this...feel better soon! Your hippo box is adorable! Sorry to hear you are leaving the team. Hoping you feel better soon. TFS all your project with us & sorry to hear you leaving the DT.. Health is important.. Hugs!!! Love your project and look forward to seeing more of your creativity when you are feeling better! Take care. Aww what a cutie. Thanks for sharing.